IN April 1999 it was revealed that the Royal Ulster Agricultural Society had plans to construct a £100 million events and exhibition centre at Sprucefield. Representatives were due to meet with Lisburn councillors to answer questions about the scheme. Teesland Group PLC said they wanted to buy the Balmoral site owned by the RUAS and then build the 'turnkey' complex for the society at Spruce field. They then intended to construct a housing development on the Balmoral site, with the Kings Hall being turned into a leisure complex. IN April 1966 Lisburn Rural Council were on the look out for a suitable site for a public convenience in Finaghy. This was the theme of the discussion at a council meeting after a letter was received from the Finaghy Business and Professional Women's Club. The letter referred to the developments in Finaghy over the years and said it would be appreciated if the council would put forward a proposal to have public toilets built in Finaghy. The council were searching for a site near the crossroads but some members said they had 'given up' trying to find a site. 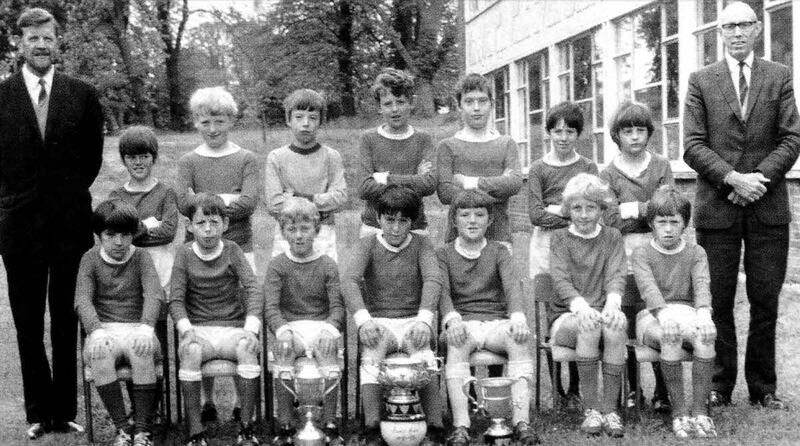 WHAT A TEAM...This is a picture we printed many years ago of the young Fort Hill football team who went through the whole season in 1972 - 33 matches unbeaten - claiming a clean sweep of trophies. A member of that team and Star reader Michael Wallace left in the picture for publication. 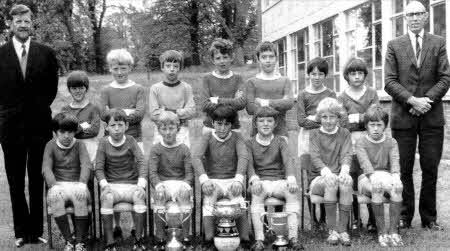 Included are, back row, from left Mr McCracken, Alfie Connolly, Walter Gilmore, Rodney Humphries, Gary McCarthy, Colin Halliday, Stephen Flynn, Bill McCullough and Mr Norris, Principal. Front left, Thomas Hempstock, Michael Wallace, Colin McKibben, Frank Crowe, captain, Ronnie Fleming, Robert Williamson and Boel Topping. IN April1985 Lisburn was praised by a Government Minister for giving a lead in the fight against unemployment. The then Commerce Minister praised local companies for recognising the way forward and having the initiative and courage to take advantage of the small unit space available in the borough. The Minister came to Lisburn to launch the industrial units at the former Grundig factory premises in Derriaghy. Several of the units were occupied by Lisburn-based businesses and the Minister chatted to employers and employees. On a quick tour of the complex, which was transformed into fifty units of varying sizes, he said the units were ideal for business which develop originally within families. "This is obviously what is happening in Lisburn and it is where the future is," he said. "I am convinced that the growth of small firms is the solution to the problem in the Province and commend those who are prepared to risk taking on small units." He added that the Government could "only create the climate and offer help," but it was up to people who were prepared to fight unemployment. THE Royal British Legion premises in Lisburn's Sackville Street were badly damaged in a blaze in April 1972. The fire broke out on a Sunday night and forensic experts examined the premises but did not find anything to suggest the fire was maliciously caused. The main hall and adjoining room were gutted but the ladies' premises and the billiard room upstairs were not affected. It was a particularly hard blow for the club since a major extension had been opened by the Governor of Northern Ireland, Lord Grey, just a few years before. Legion branch officers were at the hall on the Sunday night and Monday to assess the damage. The Star reported: "No doubt the Legionnaires will soon be making plans for the future". However a meeting of the Lisburn Chamber of Commerce just a few days after the blaze heard criticism of the way the Fire Brigade had tackled the blaze. A local jeweller, who said he had some experience of fire fighting, said he had been in the town at the time and made his way to the Legion Hall. He claimed that in such circumstances every second counted but he had seen what he believed to be a lack of urgency and on one occasion said he had seen a fireman with a portable fire extinguisher. The outgoing President of the Chamber of Commerce said he was glad the matter had been raised and said he was sure the authority would look into it in every detail and advise the Chamber accordingly. He said he felt that in some cases firemen actually use too much water and more damage was caused by water than by the actual fire. A Lisburn Councillor said firemen "seemed to have had some delay in finding the mains water." 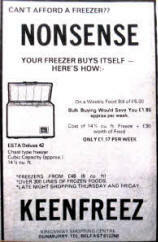 Can't afford a freezer asked this ad in 1972? Can't afford not to have one since it would save you £1.80 off the weekly £6 food bill. Those were the days. IN April 1972 Lisnagarvey Hockey Club cruised to victory in the Irish Junior Cup final. The win saw them coast to a record, after winning the Cup ten times. The local team faced off against Deighton Wanderers at London bridge Road in Dublin. 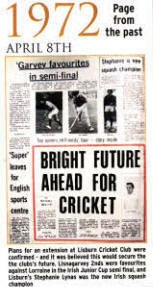 The Star reported on the victory, saying: "It was a wonderful achievement and their tenth success in all since, 1955." Theme park at the Maze? IN April 1999 there were rumours in Lisburn that the Maze prison site could be turned into a theme park. It was reported that should the prison close the land would either be offered back to the original owners or would be sold. However rumours of a theme park in the area still persisted.